Humid Washington, D.C., and semi-arid Wenatchee, Washington, have something major in common, and we aren't talking about their hot summers. Both are located in U.S. Department of Agriculture Plant Hardiness Zone 7 where the average coldest minimum winter temperature is 0 degrees F.
The USDA divides all of America into 13 winter climate zones. The average low winter temperatures of Zone 7 are roughly in the middle of colder (zones 1 to 6) and warmer (zones 8 to 13) winter climes. Its climate can seem a bit piggy-in-the-middle -- uncertain whether it's going to dip into freezing digits or play it moderate in winter. For an overall explanation of USDA zones, please read Getting Started: USDA Plant Hardiness Zones. The interactive USDA Plant Hardiness Zone Map uses two shades of light green to indicate subzones 7a and 7b. At Flowers by the Sea, we use the broader classification of the zone number and do not use the subzones indicated by the letters "a" and "b." This is because many factors affect a sage's success -- such as microclimates and beneficial placement in a yard -- and some may be more important than a half-zone difference. The kind of Salvias appropriate for a Zone 7 garden partly depends on whether you want to plant them as perennials or annuals. Gardeners in zones where frost occurs often grow many Salvias, such as varieties of Tropical Sage (Salvia coccinea 'Forest Fire'), as seasonal bedding plants. For more information about Salvias as annuals, please read Getting Started: Annual, Perennial and Shrub Sages and Portraits in Gardening: Michael and Kathi Rock's Hummingbird Journey. 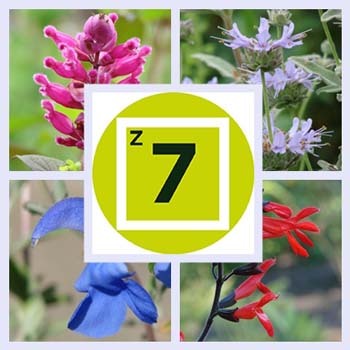 Salvias that can provide repeat performances every year in a Zone 7 garden vary depending on the geographic region where you live. Aside from winter chill, you have to consider sun exposure, amount and timing of local rainfall, summer heat and soil fertility and texture. What grows well in the White House garden may not be the best choice for an area known for central Washington State's orchard lands. Whether you live in Wenatchee or Albuquerque, New Mexico, you may decide you need an attractive moisture-conserving groundcover. One possibility is Ground Ivy Sage (S. glechomifolia) . Average annual rainfall is 9 inches in Wenatchee and 10 in Albuquerque whereas Washington, D.C. gets about four times that much. So if you live in the nation's capital, you need a heat-tolerant groundcover that also loves water. Creeping Mexican Sage (S. stolonifera) may be the answer or -- stepping away from Salvias -- the American native Cranberry Crush Cardinal Flower (Lobelia 'Cranberry Crush'), which hummingbirds love. Considering all the cultivation factors necessary for a successful flowering landscape can be overwhelming, especially if you are a new gardener. However, our Salvia Finder tool can help you sort choices based on local conditions and personal preferences. From country to suburbs to city, FBTS receives feedback from customers all across the nation. So we know what grows where. Please call or email us. We're happy to help you dodge bad choices in the Zone 7 garden as you play piggy in the middle with the weather.